Vulnerability research is becoming more and more challenging and finding actionable and reliable cyber capabilities (which are a small subset of all the existing vulnerabilities) is now a fantastically complex endeavor. Nowadays many skillful independent researchers are convinced to give away their findings for a pat on their shoulders and a few thousand dollars while software vendors make (or save) billions thanks to their work, which in turn is damaging the quality of their future research due to a lack of funds. For this reason, we pledged to pay the highest rewards on the market to those who deserve it, to financially help young talents to fulfill their potential, and defined our contracts in such a way that researchers can have enough resources to work full time on increasingly difficult tasks, legally and safely. The Vulnerability Research Hub is our innovative online collaboration platform, a safe environment where researchers can anonymously submit, discuss and sell single 0day exploits and chains of exploits. The platform is organized as a professional and streamlined set of workflows, with an ergonomic interface and maximum OpSec for all the participants. Through the VRH the Crowdfense team of experts proactively helps you to speed up and standardize the process of evaluating, testing, improving and documenting your vulnerability research findings, without sharing the code until a contract is defined and an economic agreement is found. We take care of the hurdles so you can achieve your goals. Join us! To sign up to the VRH please click here. Crowdfense was designed for security Researchers, by security Researchers. 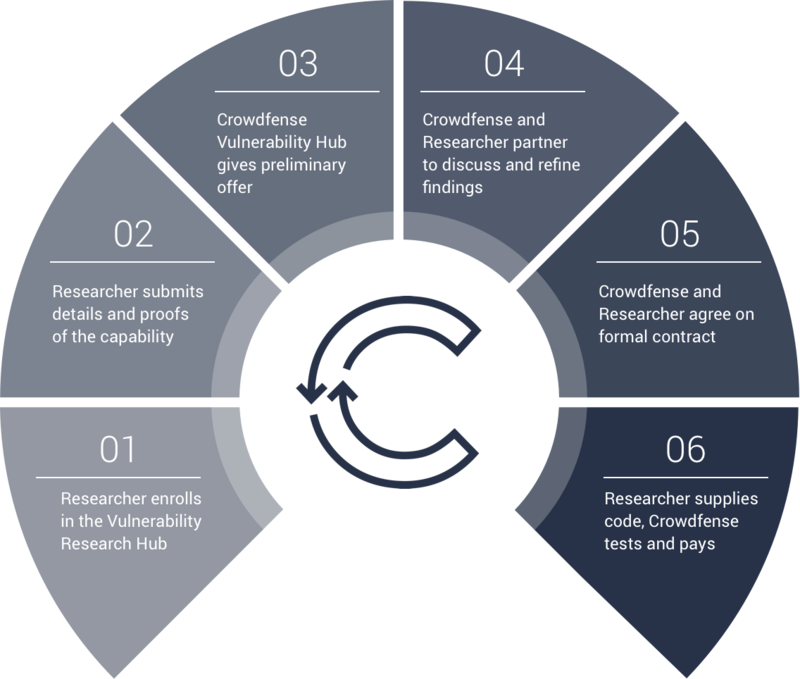 Submit your original research and let Crowdfense find the right institutional partner, even if it’s not within the scope of our Bug Bounty program. Check out our new 0day Acquisition Program, we offer a total of 15M USD in bounties. Send us your resume, we’re hiring.